Document Description: Around 250 students and community members gathered on August 20, 2018 at the Peace and Justice Plaza on Franklin Street for a demonstration in support of Maya Little and the charges she faced for her act of contextualization. Gathered in the plaza, across the street from McCorkle Place, Little stood in front of four gray banners, each approximately twenty feet tall, which she explained were “an alternative monument” to “a world without white supremacy.” The crowd moved across the street after a series of speeches, gathering around the Confederate Monument while several police officers watched. 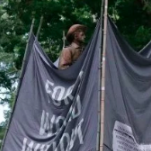 Students and community members held the banners around the four sides of the monument, obscuring the entire Confederate Monument behind their counter-monument, one side of which listed names of victims of anti-Black violence, beginning with “unnamed Black woman beaten by Julian Carr.” After approximately an hour, protestors, working behind the screen of the banners, tied a rope around the Confederate Monument and others on the ground pulled the rope. The Confederate soldier atop the monument fell to the ground. Citation: Toppling of the Confederate Monument, 20 August 2018. Photo from Calfas, Jennifer, “Why UNC’s Toppled ‘Silent Sam’ Statue Has Been a Focus Point of Protest for Decades,” Time, 21 August 2018.